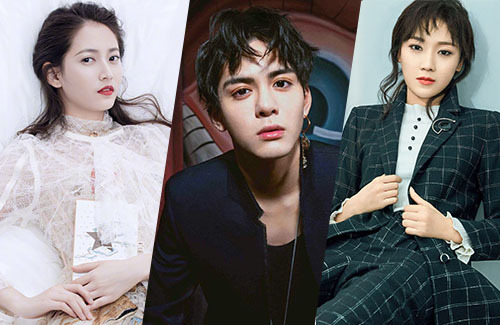 The Chinese television drama remake of Jin Yong’s (金庸) The Heaven Sword and Dragon Saber <倚天屠龍記> has unveiled its official cast list, and not many fans are pleased. Produced by Cathay Media, the remake of the Jin Yong wuxia classic will be headlined by rising star Joseph Zeng (曾舜晞), who will be playing the central character Zhang Wuji. Joseph’s casting was met with criticism, and the rookie actor has been criticized for having poor acting after appearing in the variety talent show The Birth of an Actor <演员的诞生>. Joseph will also be carrying another wuxia remake this year, starring as Xiaoyu’er in Juedai Shuangjiao <絕代雙驕>. The female leads Zhao Min and Zhou Zhiruo will be portrayed by Yukee Chen Yuqi (陈钰琪) and Joyce Jian Renzi (菅纫姿). Yukee, who is managed by Tiffany Tang’s Studio, is best known for her critical successful performances in The Princess Weiyoung <锦绣未央> and A Chinese Odyssey: Love of Eternity <大话西游之爱你一万年>. Joyce’s casting as Zhou Zhiruo is met with apprehension, but her performance in Game of Hunting <猎场> starring opposite Hu Ge (胡歌) was well-received. Other notable stars that have been cast in the remake include Kathy Chow (周海媚) as morally conflicted Abbess Miejue, Louis Fan (樊少皇) as the antagonist Cheng Kun, and Wakin Chau (周華健) as the evil Jian Jie. Kathy Chow previously portrayed Zhou Zhiruo in the 1994 Taiwanese remake. TVB will also be remaking The Heaven Sword and Dragon Saber into film this year, with Rebecca Zhu (朱晨麗) confirmed to star as Zhou Zhiruo. Almost everybody seems to be ok with Chen Yuqi as Min Min because of her success in Princess Wei Young as a playful naughty princess. Why not just choose the boy who played Li Minde to be Wu Ji as well? He looks very young, but since Joseph Zeng looks young as well, Li Minde actually has really good acting skills and matches Chen Yuqi very well. They probably got many shippers too. The girl for Zhi Ruo seems to look much more mature standing next to Chen Yuqi, and she likely won’t escape from the comparison to Gao Yuanyuan. The dude in the middle looks effing creepy. Fake big eyes on guys is not a good look lol. Anyway this looks like another idol drama. Pass! Yhea it is unfortunate that eyes like that made me very paranoia and suspicious of plastic surgery. Especially on women like Li yitong whose silk worm baggy eye never at least shuts once in comparison with Joseph. The last time I remember anybody having such big beautiful exotic eyes were Zhao Wei and her beautiful sister Ruby Lin, I thought theirs were so big already, but these days eyes are getting even bigger than that. @davy – Don’t forget Ady An! she has very beautiful natural eyes as well. These days almost every actor not only has big eyes but porcelain white skin, v-shape face and the “skinny” tall nose feature. No one is original anymore because every one looks the same. I really miss the 70/80/90s look actors had back then. I really hate this whole flower boy look Chinese actors has these days. What happened to masculine men? I feel so embarrassed for them lol. They don’t look like guys… but not girls either. lord help them lol. Sorry, WHAT? TVB, remaking HSDS? Good! Rebecca as Chow Chi Yuek? NO!! GOD NO!! Should give it to.. what’s her name? The actress in My Ages Apart, the sister who is a doctor? I am dying to see her in costume setting. She has the face of a wuxia girl. Rebecca with her accented voice should play the foreign heroine character. Who is playing Cheung Mo Kei? Hubert better be in this series doing something. C version, no comment. None of them memorable face. It’s always casting over suitability of actor. @funnlim Wong Jing will be adapting “The Heaven Sword and Dragon Saber” into a movie. Don’t have a lot of confidence in this project. Probably butcher/ change the story and just use the characters for a different take. Otherwise, nothing refreshing to offer viewers in a movie version. @jayne I think Wong Jing missed his chance at making HSDS into a movie. He butchered his first attempt decades ago with version starring Jet Li when he ended it half way and decided not to film due to bad comments. The movie was bad and the jokes were lame but at least the cast was very attractive, it had martial arts actors and it was an entertaining movie over all. I would have goen to the second half of the movie if he did make it. I don’t see how he thinks he can squeeze the whole book into one movie with a much well less talented, less attractive and less versatile cast. A few years ago, there were news that Wong Jing wanted to make part 2 of Jet Li’s HSDS. Maybe this film with TVB is the one. Heaven Sword and Dragon Sabre and State of Divinity are my two all time favourites – Tony Leung and Jackie Lui’s versions. HSDS story of two generations and a more complicated plot than State of Divinity. Wonder they are going to compress into a movie? I’m more interest in seeing Kathy Chow played Abbess Mijue. She has upgraded from student to sifu. She played Zhou Zhiruo in the 1993 version if HSDS.